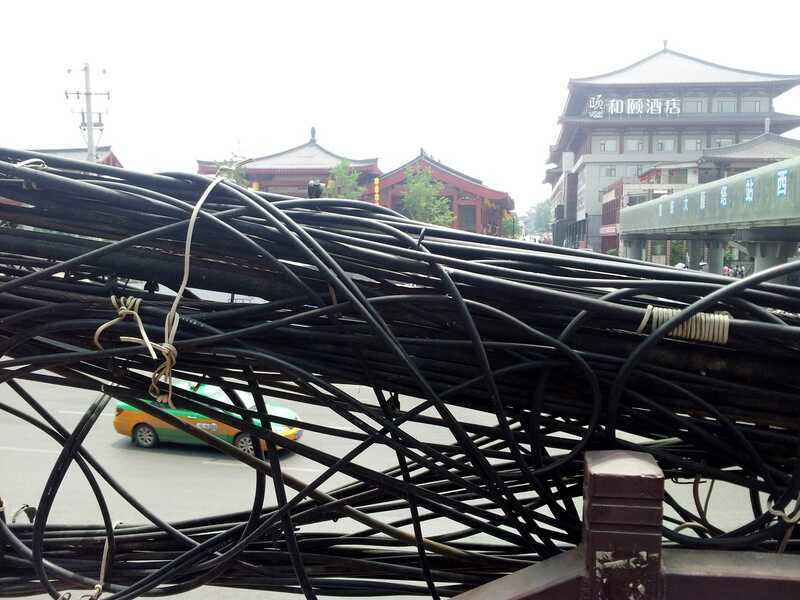 If you are at a loss about what India and China share, just look at the electrical cables. They are as tangled in China as they are in India. A Ming dynasty novel written about the travel of the monk Xuanzang to China is called "Journey to the West". I understand that it introduces some mythical travelling companions for the monk, one of whom is the popular monkey king. His role was to help the monk to cross borders. 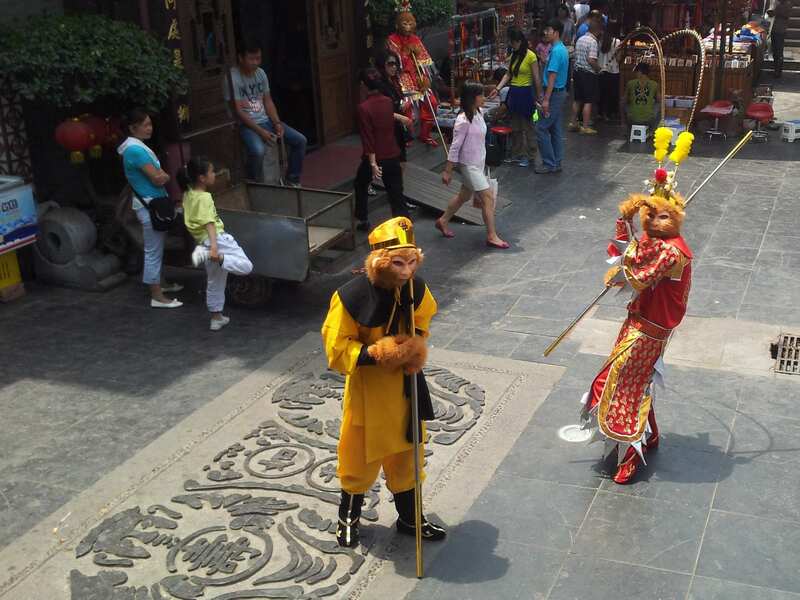 The monkey king seems to be a popular character for street-side entertainers. We saw the first one when we visited Hangzhou. In Xi’an they are even more common. This pair was vying for audience with two more pairs near the Big Wild Goose Pagoda, the place where Xuanzang lived after returning from India. Vying may be too strong a word. There was a crowd around each. The monkey king seems to be a really popular character. I’m sure there is some difference between the two characters in the photo which I have not appreciated. Can anyone let me know? If there is a photo which you can click in any country on earth, it has to be this! 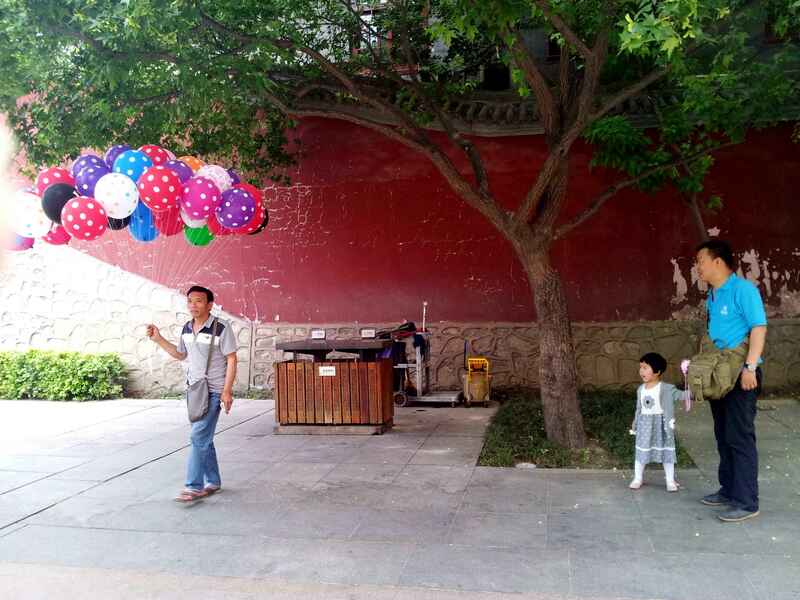 A child unable to tear herself away from the sight of balloons. Another universality which I’m fond of when learning a language is to listen to a child say the same thing over and over again. I do that a lot now in China. If I were to say that the Chinese take more selfies than any other nation, someone would certainly point out that there are more Chinese than other nationalities in the world, so this is almost certainly going to be true. But it is more than that. 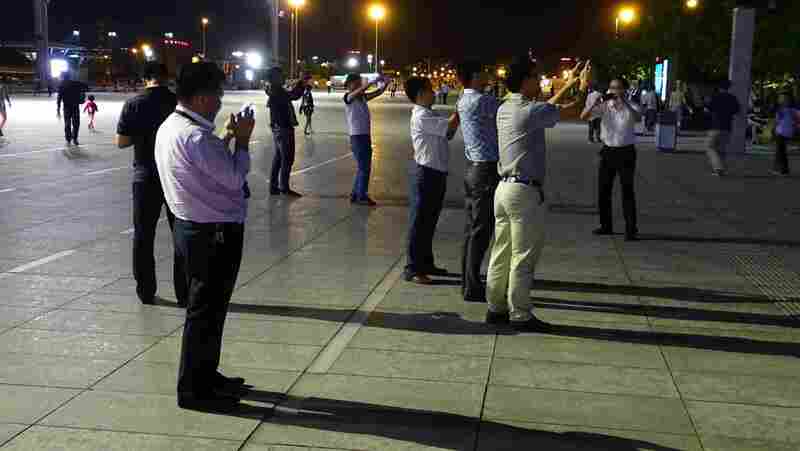 The Chinese seem to take more selfies per capita than the next ten nations put together. There is even an industry of selfie sticks: you can buy them from street vendors almost anywhere. At least in one place, the Olympic stadium in Beijing, I saw a person hiring them out. You pay a deposit equal to the price of the stick, and then when you bring back the stick you get some money back. You know that you are at one end of the old silk route when you go to a market in Xi’an and shops sell you dates and dried persimmons. The dates are very good, and cheaper than in India. The dried persimmons were new to me. They are sweeter than dried apricots, very flavourful, and large. An old imperial capital holds many stories. One of the famous stories of Chang’an (today’s Xi’an) is the journey of the monk Xuanzang to India (he is known in India as Huen Tsang). He made this journey in the middle of the 7th century, during China’s T’ang dynasty, and the reign of Harshavardhana in India. His journey followed the silk route west and then turned south entering India through Afghanistan, and eventually took him to Patna and Nalanda. A good account of the journey is given in Wikipedia. He learnt under the master Silabhadra in Nalanda and returned to China with manuscripts which were translated by a team of monks in the Big Wild Goose Pagoda (Dayan Ta) of Xi’an. The pagoda is surrounded by a garden which was full of families with children on the Sunday when we visited. As at all Chinese tourist draws, there were many tourists and large but fast-moving queues for the expensive tickets. Inside, there was the usual temple, busy with young people praying hard to pass their exams. You need to pay separately to climb the seven story pagoda. 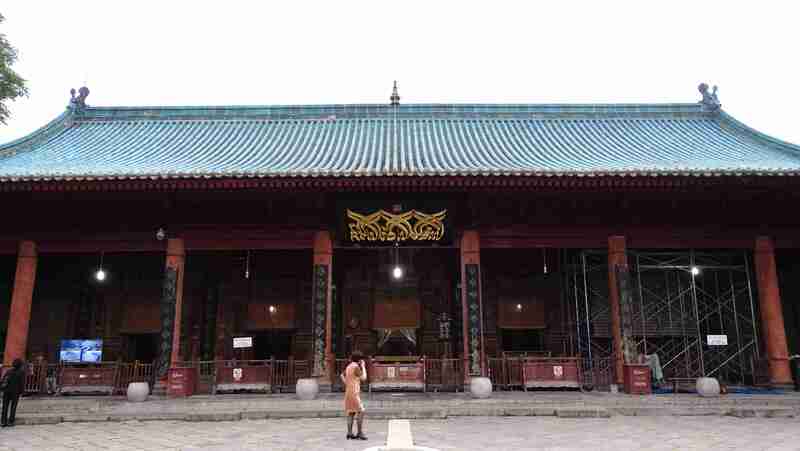 But the real heart of this place is the museum for Xuanzang. There are three halls, with depictions of his journeys. 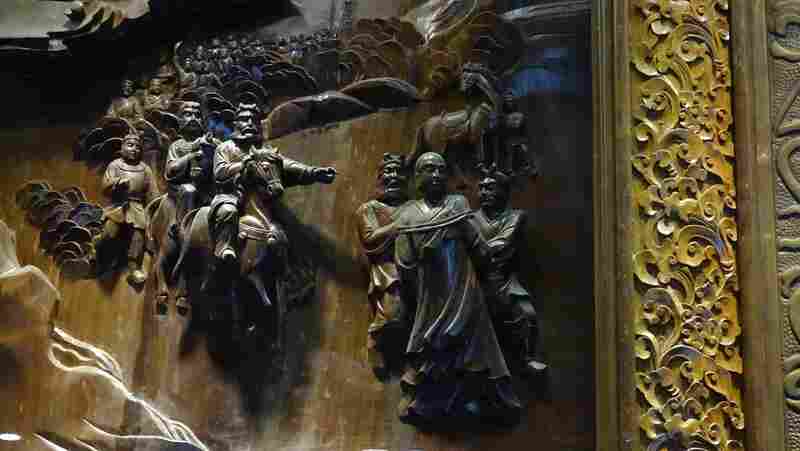 The journey was not without trouble: he was captured by bandits more than once, as shown in the carved wooden panels (photo above). He wrote about his journeys in a book called the “Great T’ang Records on the Western Regions”. Almost a thousand years later a novel, “Journey to the West”, was written about his journeys, which is probably the source of most people’s knowledge about the monk. The translation of the buddhist texts Xuanzang brought back to China was a major cultural milestone. In Chinese culture it gave rise to new techniques of translation and accurate scholarship. Its influence on the world’s culture was also remarkable, since it provided texts which were the basis of Buddhism’s further spread eastwards. Later when some of the original Pali texts were lost in India, these translations provided a basis for their reconstruction. The walls of the museum inside the Pagoda grounds also depict this long scholarly work. 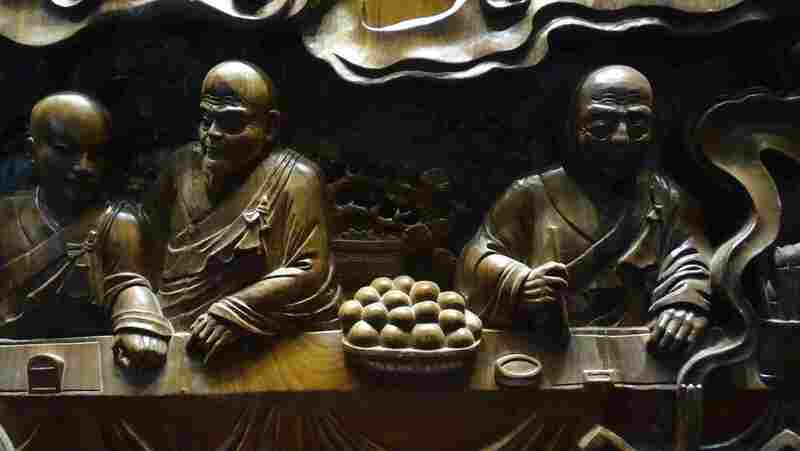 Interestingly, the scholars are portrayed working at tables piled with fruits (see photo above), which perhaps indicates the support that the T’ang emperor gave to this enterprise. The story of the monk’s journey to India was an important chapter in school textbooks in India, although it had faded a little in my memory. It is interesting to see that the story is even more well-known in China. Close to the terracotta warriors of Xi’an is another major archaeological site: the underground tomb of the first emperor Qin Shih Huang. Old Chinese records talk of a huge tomb with terracotta representations of his capital and the nearby rivers recreated with mercury. The hillock in the photo above is where the tomb is supposed to lie. All around it excavations have exposed not only the terracotta army, but also terracotta representations of acrobats and entertainers. In one pit we saw the skeletons of real horses with terracotta charioteers. We read accounts which say that mercury levels in the soil near the hill are off the scale. Everyone believes that the tomb really is here. But when you visit, there is nothing to see. 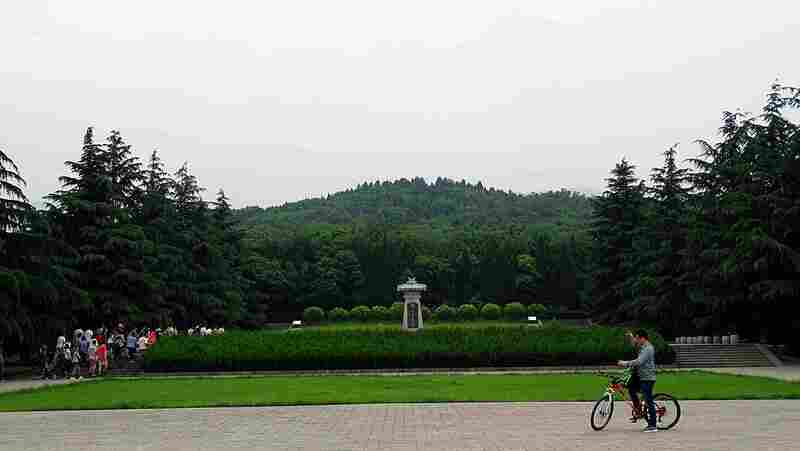 All around the supposed tomb is a garden, where busloads of Chinese tourists come on guided tours. We followed a tour guide and his entourage in the mistaken belief that we had missed the entrance. There is no entrance. There has been no digging. It was mysterious to us. A kind young man (there are so many people in China who are so very kind to foreigners) who spoke very good English told us that it is bad luck to dig up the tomb, so the government is not doing it. There it was again. Luck. Does belief in it really play a role in determining minor government policy like this? Or perhaps even major ones? In India there are rumours of various prime ministers having consulted astrologers on policy. Does the notion of luck play the same role in China? Can’t you wait until they grow? In the last couple of decades doggerel verses in English have erupted on road signs all over India. Now the disease seems to have crossed the Himalayas and arrived in China. A city which has been a capital for centuries tends to accrete interesting monuments. This is true of Rome, Kyoto, and Paris. A city which has been an imperial capital for long also has cross-cultural monuments. Delhi is the pre-eminent among these, but Xi’an, at one end of the Silk Route, is also very interesting. Among these, the most interesting has to be the Grand Mosque of Xi’an. It stands in a warren of streets behind the Drum Tower of Xi’an, its location indicated by a small road sign in English which you can easily miss. If you follow the sign you enter a bazaar full of tourist tat. Walk past them, and after some time you are near the East Gate of the mosque. The mosque was first built during the T’ang dynasty (around 750 AD) and is strongly influenced by Chinese culture and aesthetics. This makes it different from anything I have seen before. The first difference was that we had to pay to enter. I have never had to pay an entry fee to a mosque, so I guess this counts as a Chinese cultural influence. You enter a courtyard and have to cross two more before you come to the last courtyard with westward facing prayer hall. The buildings all have the tiled roofs with upturned corners of traditional Chinese architecture. There are miniature pagodas and gardens. In most mosques elsewhere in the world you find decorative motifs with flowers and vines only. This has dragons, and turtles at the base of columns. Perhaps the most disconcerting visual aspect of the mosque is not in the dragons or the tiled roofs, but in the images of plants and leaves. In India, and in most of the rest of the world, decorative figures in Islamic architecture capture symmetries. 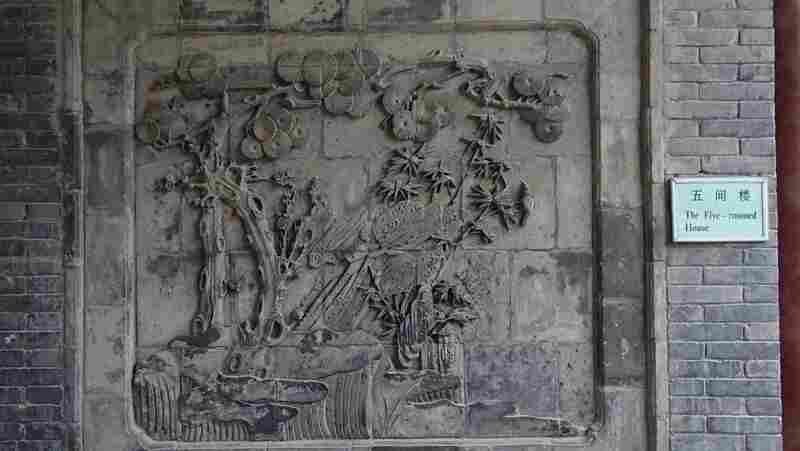 For example, one marvels at the interleaving of octagonal and hexagonal symmetries of vines and leaves in the friezes of Fatehpur Sikri. In the grand mosque the trees and vines that are depicted follow the asymmetric aesthetic norms of China (see the photo above). The calligraphy is a mixture of Chinese and Arabic. In the first couple of courtyards I had to search to find the Arabic script. The arches and steles were full of elegant Chinese calligraphy. Only from the third courtyard does one start to see the Arabic script more often. The prayer hall (pictured below) has lovely Arabic calligraphy. To my untrained eye, it seems that there is an attempt here to bind the Chinese calligraphic style within the Arabic. At first sight the prayer hall seemed like it could belong to any mosque anywhere in the world, but then I saw in places where there would be verses from the Quran there was Chinese calligraphy. Clearly the Quran has been transcribed into Chinese, another cultural innovation which has not recurred in Islam. The Silk Route shuttled goods, technology and ideas across the known world of its time. I wonder whether it brought Arabs and their Islam to settle in the imperial capital of China, or whether the Chinese converted to Islam elsewhere and brought back the customs of a foreign religion. The architecture of the mosque, and the food habits of the region, a lack of pork and the prevalence of halal meat, could be used to argue for either. 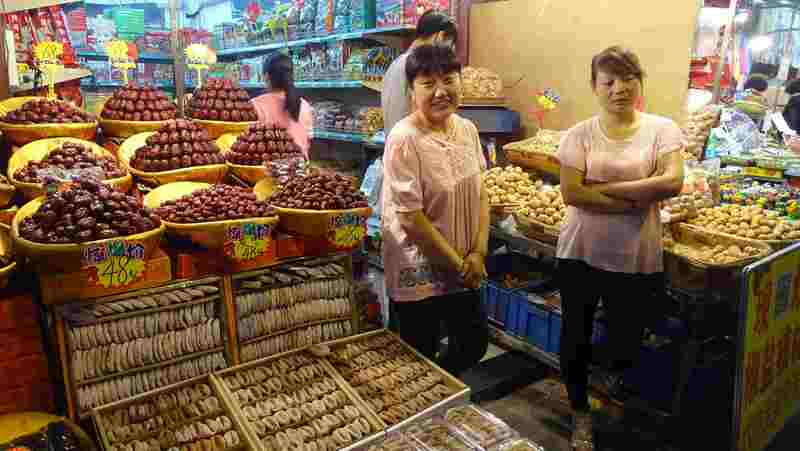 However, the range of sweets available in Xi’an seems to indicate an Arabic tradition. Perhaps the persistence of Arabic also points in the same direction. It needs experts to pin this down. I am happy to marvel at the syncretic end product. No middle men in China? In China we keep seeing artisans selling their own work. 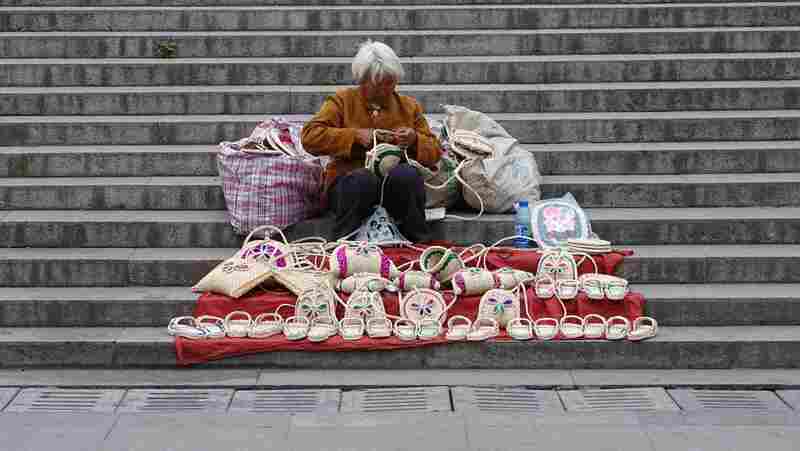 This lady was sitting near the Bell Tower of Xi’an making these lovely pieces with rope. The work looks very similar to the corresponding Indian work. I suppose she must be making a reasonable living. What strikes me most about this is the difference with India, where the artisans usually work in the village and there is a long chain of middlemen between us and them. The market for handicrafts in India has started changing in recent years with cooperatives and direct sales, although I think the volumes involved in this newer market is still much smaller than in the older system. I guess a worker’s cooperative could work somewhat differently in China. Author I. J. KhanewalaPosted on May 17, 2015 May 17, 2015 Categories China, TravelTags handicrafts, street vendorsLeave a comment on No middle men in China?